Healthcare administrators play a unique role in every healthcare organization, advocating for practitioners and patients alike. As a healthcare administrator, you have to stay on top of changes to policies, programs, and legislation, and consider the implications for both healthcare professionals and consumers. And in a notoriously chaotic environment, you have to be a constant source of clarity, organization, and structure. Whether you’re looking to start your career in the public or private health sector, or you have several years of experience, an online MHA is a great way to give you a leg up. You don’t have to move across the country to learn this potent blend of people skills, administrative expertise, and healthcare knowledge. There are countless online healthcare administration degree programs that can land you the credentials and expertise you need to propel your career. To help you sort through them all, we’ve used data from The National Center for Education Statistics and ratings from school-ranking entities like TopMastersInHealthcare.com, Healthcare-Management-Degree.net, TheBestSchools.org, CollegeChoice.net, BestCollegeReviews.org, and BestColleges.com—so this list of the top 10 online MHA programs is the best of the best. While a lot of people get a master’s in the hopes of securing a better job, nobody wants to spend a fortune doing it. Some of the best online MHA programs can get pretty expensive. That’s not to say that they aren’t worth it, but if you’re worried about the cost of your education, you may want to look a little further down the list. 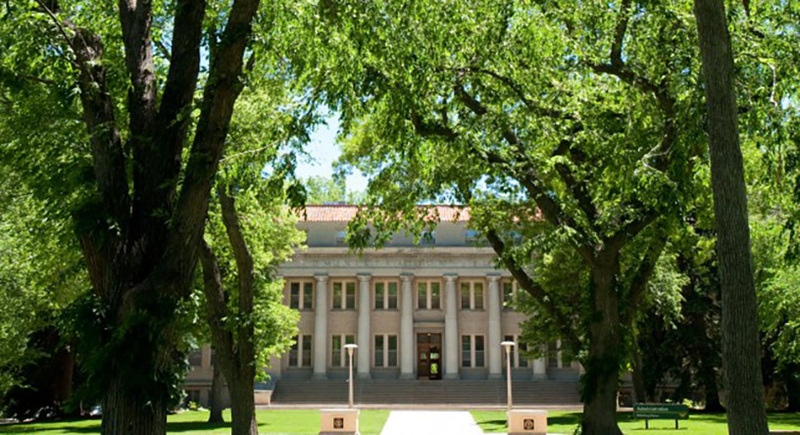 Colorado State University (#6 on our list) delivers consistently affordable education, regardless of where you live. You can complete your entire MHA for about $18,000 total. Even if you don’t have financial aid, that’s a very affordable master’s level education. The University of Scranton (#8) costs just a little more—$11,000 per year, regardless of where you live. For some people, starting a degree program is rewarding in itself. Every class gives you new tools, skills, and insights you can immediately apply in the workplace. But most people start a degree program because they want a degree. If you want to give yourself the best odds of actually completing your MHA degree, look no further than #1 on our list, University of Southern California. They have a 92% graduation rate. Although to be fair, University of North Carolina (#4) is right behind them with 91%. 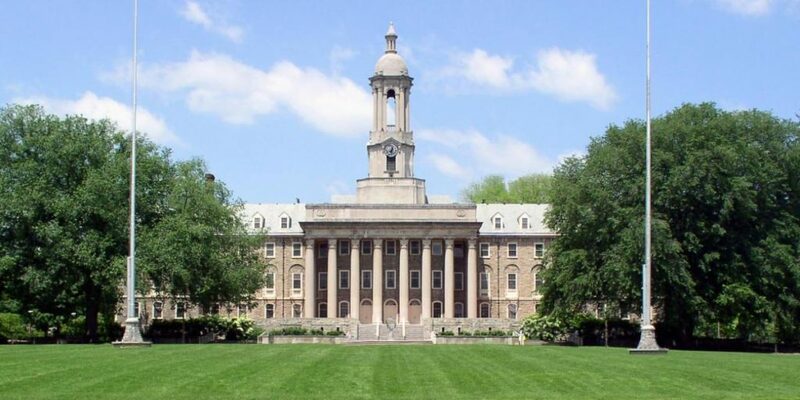 #2 on our list, Penn State University, has a 25% graduation rate. That’s less than half the national average, but it gives us an opportunity to point something out: graduation rate often isn’t as meaningful as it looks. In order to “count” towards a school’s graduation rate, students have to be attending a college for the first time (not a transfer student) and full time. Then they have 150% of the “normal time” to graduate. If they don’t finish in that time, they count against the graduation rate. It doesn’t mean they didn’t eventually finish the program. And since most of these MHA programs are designed to take one to two years, but give you as many as 5+ years to finish, a low graduation rate shouldn’t be a shocker. But here’s the kicker: only 6% of PSU’s students at the World Campus were first time, full time students. All that to say, even PSU’s staggering 25% graduation rate shouldn’t scare you away. Only one school on this list reported their job placement rate. But even if the others had reported it, they couldn’t compete with Minnesota State University’s 100% job placement rate after 12 months. They’re #10 on our list, but if you don’t currently have a job, or you’re on the hunt for a better one, they’re worth a strong consideration. Granted, this is a master’s program. Several of the schools on this list require you to have several years of professional healthcare management experience. One even requires you to be working full time while taking classes! So probably, job placement rate isn’t the best measure of the quality of one of these programs. It’s sure nice to look at and think about though. Crafting your degree for a specific position or organization is one of the surest ways to bump your resume to the top. Specializations, concentrations, and emphases help you stand out from the mass of applicants with what looks like the same education on paper. In my experience ranking online college degrees, no school can compete with Colorado State University’s Global Campus (#6). They offer a-la-carte specializations for 12 credits, and they have a lot to choose from. The online MHA program is no exception. There are 14 specializations you can add to an MHA from CSU. University of Southern California offers an online executive master of health administration through the Sol Price School of Public Policy. This program is not fully online. There are two five day residencies that take place on campus. Through the program, you’ll learn how to navigate the intricacies of healthcare administration, exploring how healthcare economics impact current health issues. You’ll also prepare to be a lifelong student of healthcare, learning how to utilize the latest research to teach both caregivers and consumers. The Sol Price School of Public Policy has been around for almost 90 years, and has built a reputation for both groundbreaking research and ethical approaches to social issues. 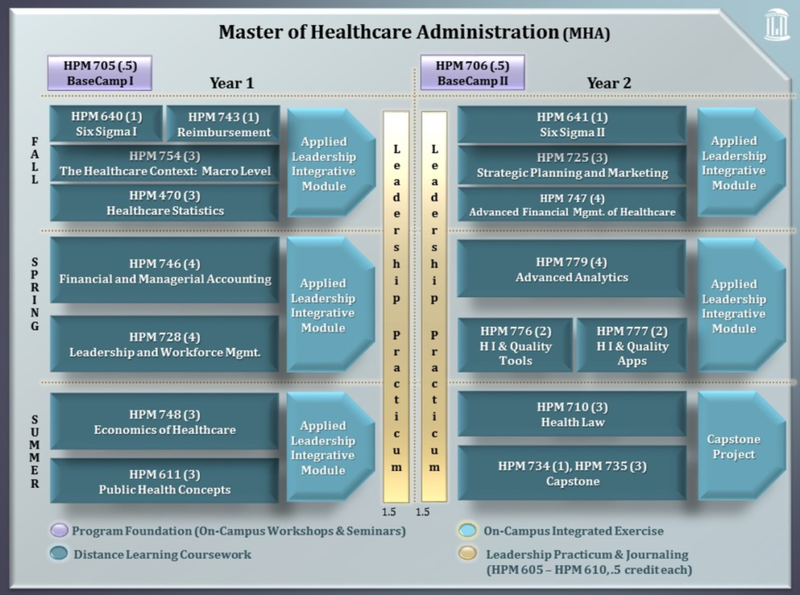 Penn State University offers an online master of health administration in health policy and administration. The program is a collaboration between their World Campus, the Department of Health Policy and Administration, and the School of Public Affairs. This program is not fully online. In addition to online classes and an online independent study, you’ll have two “face-to-face management intensives.” These are weeklong residency experiences that include coursework, networking, and events at healthcare organizations. You need at least five years of full-time professional experience (doesn’t have to be in healthcare) to be admitted to the program. George Washington University offers an online master of health administration through the Milken Institute of Public Health. This program is not fully online. In addition to online courses, you’ll have four “real-world immersion experiences” on campus. Two of the immersions are 40 hours long, and two are 20 hours long. University of North Carolina offers an online health policy and management executive MHA through the Gillings School of Global Public Health. This program is not fully online. There are a total of six on-campus workshops—three per year. These take place over a total of eight weekdays and six weekend days. All of UNC’s MHA students are employed full time. You’ll take class with master of public health (MPH) students, and UNC encourages networking with them to add their unique perspective to your experience. Note: While the course sequence is designed to be completed in two years, you have up to five years to complete the program. They discourage getting “off-track,” but sometimes that can’t be avoided (especially since all UNC’s MHA students also work full time). University of Cincinnati offers an online master of health administration through a partnership between the College of Allied Health Sciences and the Carl H. Lindner College of Business. This program is fully online. There are no residencies, immersion experiences, or required campus visits of any kind. Colorado State University offers an online master’s in healthcare administration through their Global Campus. This program is fully online. There are no required campus visits of any kind. You’d be hard-pressed to find an online program that offers more specialization options than CSU Global. This is the perfect program to craft your degree for a particular organization or position. Note: It doesn’t appear that CSU’s online MHA requires any minimum professional experience. Saint Joseph’s University offers an online master of science in health administration. This program is fully online. It doesn’t appear that there are any residency requirements or on-campus visits included in the program. You can explore the courses offered in each concentration as well as core courses on the website. Note: SJU’s website doesn’t state that there is a required minimum for professional experience. Fun fact: SJU has a helpful article that tells you more about what a job in health administration entails. The University of Scranton offers an online master in health administration degree through their Jesuit Health Leadership Program. This program is not fully online. However, it doesn’t appear that you have to ever set foot on campus. There is a three credit supervised internship that requires 150 hours of fieldwork, but it looks like you can complete it locally. University of Scranton boasts that it has one of the few programs with “expert practitioner faculty.” The program’s Department Chair also sits on the board of directors for the Commission on Accreditation of Healthcare Management Education. You can see bio information for all of the programs faculty on the page I linked above. University of Central Florida offers an online executive master of healthcare administration through their College of Health and Public Affairs. This program is fully online. There are no required campus visits. You must have a minimum of three years of healthcare management experience to be admitted to the program. This program is not fully online,but you won’t have to go to the campus. Towards the end of the program there’s a capstone project which takes place at a “mutually agreeable site.” The first half of the project is an 80 hour internship at a healthcare organization (which is very brief compared to most), and the second half is a written project in which you develop a solution to one of that organization’s problems. You need to write a 750 word essay as part of your application to the program. That’s not very long, but I haven’t seen that in very many applications. Note: That job placement rate is really impressive. But the data is from one year of graduates (2015), and I’m just speculating, but I’d imagine the sample size is pretty small to have such nice round percentages (90%, 100%). Plus, in a program like this, most people probably already have a job. OK, I think that’s enough disclaimers. Fun fact: MSU has developed a mission, vision, and values specifically for the MHA program. Most of the schools on this list are accredited by different regional accrediting bodies—three from the Higher Learning Commission and four from the Middle States Commission on Higher Education, two from the Southern Association of Colleges and Schools, and one from the Western Association of Schools and Colleges. Three of them have an additional stamp of approval from CAHME. We can’t tell you exactly which school is the best choice for you—and you shouldn’t let anyone else do that, either. You have to weigh the factors that are most important to you and let that guide your decision. Choosing a degree program is a huge investment—both in terms of what it immediately costs you and how it affects your life. So take your time.